between breaths with sound, movement, and interlogues. Director/producer Denzel Belin developed the concept with his ensemble of improvisers (Sam Beeson, Max Beyer, Zoa Dru, Joseph Facente, Keren Gudeman, Josh Krauskopf, Shea Roberts, Mawrgyn Roper, Jeffrey Ross, Gurayn Sylte, Alicia Wheelock, and Cliff Zawasky; with tech Erik Ostrom mixing lights and sound live as the show happens). A member of the ensemble steps forward and asks for a suggestion - in this performance, something you’d leave in the car that isn’t a car part, to which someone inexplicably called out “Marshmallows!” OK… Then a member of the ensemble serves as conductor while the rest of the group pretends to be a choir, and they riff, musically and/or rhythmically, on the subject of marshmallows. Each improvisor comes up with their own word/phrase/sounds for their marshmallow-related bit. The conductor adds each member in turn until there’s a whole mixture of things going on, and raises and lowers the volume and speed of sections, the whole group or individuals to create a verbal symphony. After a couple of minutes of this, when the group’s working well as a unit, the improv proper begins. Of course, you start with a word from the audience and by the end it’s pretty far afield from the opening suggestion, but that’s half the fun, seeing where the word and idea association goes. This performance, a young man inept at toasting marshmallows over the campfire is joined by his judgmental father and more beloved sister (who’s of course a marshallow pro). From there we got a pair of roommates who realize it doesn’t matter if they can’t find their car keys. They can order anything they need to be delivered and never have to leave the house again. That morphs into a guy man-splaining outdoor barbecue grilling to friends, and then to a mother/daughter confrontation in a different scenario, closing out with a pair of women (who might be immortal) getting really into the tactile sensations of the velvet walls and furniture of an ornate lobby/department store. The added wrinkle to this improv flow is the interior thoughts of the characters becoming exterior where we can see them at several points in each scene. There are bells on either side of the stage. At any point, the improvisers on the sidelines not actively involved in the scene can ring the bell. The lights shift, the sideline improviser jumps in and starts vocalizing the thoughts of one of the characters. Other sideline improvisors jump in and do the same until the whole ensemble is creating a wall of sound (akin to the opening symphony) that supports the scene that’s been going on. The characters themselves can also provide an interior monologue of their characters’ thoughts - which may be very different from the things they’re saying in real life to the other characters. Other improvisers can riff on the monologue insights, too. After a minute or so of this, one of the improvisers rings the bell again, the others retreat to the sidelines and the scene continues. The audience now watches the scene with new eyes, knowing things about the characters they didn’t know before. For instance, the inept marshmallow toasting son, envious of his perfect sister, wonders in his private thoughts if the sister might be adopted. A sideline improviser jumps in and repeats “What if she’s adopted?” several times. As this continues, the father’s interior monologue laments, “I don’t know how to tell my son he’s adopted.” One of the sideline improvisers, channeling the son’s thoughts switches from thinking about his sister being adopted to chanting “What if I am?” Another improviser struts around the sister, self-satisfied, chanting about her marshmallow toasting prowess. Another improviser reinforces the father’s conundrum. Another improviser is actually the inner thoughts of the campfire. Another improviser is the inner thoughts of yet another marshmallow meeting its fiery end, etc. This building, multi-layered interior monologue continues until someone rings the bell and pulls them back into the reality of the original scene. They go in and out of this fugue state more than once in any given scene before moving on to the next scenario. It’s a fun conceit but it’s doubly challenging because it risks running afoul of one of the primary philosophies of improv comedy - “yes, and…” Now, I’m not an improviser myself but from conversations I’ve had with improv artists, “yes, and…” is one of the things that they all find so great about doing improv. A good improv performer never negates another improviser’s choices onstage. So, for instance, if someone starts a scene by saying, “I’m a giraffe,” the next person to enter the scene doesn’t say “no, you’re not, you’re an elephant.” If someone says, “we’re in a library,” someone else doesn’t say, “can’t you see we’re actually on a battleship?” Yes, and… you affirm your scene partner’s choice and build on it, you don’t try to restart the scene. No choice is a bad choice. All decisions are reinforced, rather than undercut. You share the stage and build the story together. If someone were writing in the style of Interludes, they might throw in random plot twists. But in improv, something like that has the capacity to undercut or negate someone else’s choices onstage. There are loopholes built into this, of course. Interludes allows the characters themselves to rewrite their own history or share with the audience they’re actually lying, by offering up interior monologues before returning to the regular scene. And I suppose over time, different pairings of partners in the ensemble, perhaps the ensemble as a whole, will build so much trust with one another that they can throw each other a curveball and not undermine another performer’s confidence. Right now, though, you can sometimes see the improvisers straining in order not to go against the most fundamental rules of their own training. Because no one wants to be a selfish or uncooperative improviser. On the flip side, you can see the positive effects of this "yes, and..." philosophy in the way that all the improv artists on a sidelines of a given scene in Interludes are listening extremely carefully to every word the performers in the scene are saying. They’re watching body language, personality, listening to them describe the situation and surroundings. They’re watching for every possible angle into the underbelly of the scene the second somebody rings that bell. But right now a lot of what’s going on is a repetition of what’s already been said or implied, rather than genuinely new information. There are notable exceptions of course, in each and every scene - not surprisingly especially in the last one. The trick here will be for everyone to be ready to leap off and follow other people over the cliff right off the bat at the very start of the set, rather than needing most of the set to give themselves permission to really cut loose inside the concept. It’s hard enough to build a scene and play out its variations. To literally build another layer of reality under the one that’s just be created, that’s a whole other level of difficulty. It’s a fun concept but not an easy one so I applaud the ensemble for throwing themselves into it. It’s clear they’ve been working on it a lot already because they’re all working together really well, and they’re coming up with some inventive scenarios - probably in no small measure because they’re listening to each other that much more intensely in this setup. I’d be really curious to see them again later in the run and see how they’ve grown as a unit in taking chances in both scene making and the interludes that cut into them. This is a concept that will only get better with time. The opening act the night I saw Interludes was not their regular opening act for the remainder of the run so I won’t dwell on that part of the set. Their opener for all upcoming performances is BollyProv - Bollywood-inspired improv, which I’m kind of sorry I missed this time because that also sounds like fun. 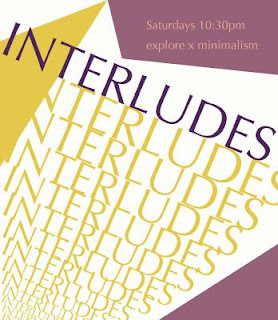 Interludes plays the Saturday night 10:30pm slot at HUGE improv theater through October 28, 2017. *HUGE improv theater wisely gives potential audience members something consistent to hang on to by seeding the schedule with several different nights of showcases, and then arranging for one or two month runs of a slate of concept shows on Friday and Saturday nights. They run Wednesday through Monday (Tuesdays are their dark nights). Sundays have Improv-A-Go-Go, where multiple groups are scheduled in multi-week runs - these groups can be at any level of experience, so it’s great for new performers, newly formed groups, or artists wanting to just try out new techniques. Mondays it’s the veteran improv artists putting on Show X. Huge Wednesdays seem like another version of Improv-A-Go-Go, though these acts may be more curated than the IAGG sign-ups. Thursdays it’s Space Jam, where any improv artist can show up that night, sign in early and warmup, then take the stage with fellow improvisers just wanting to play and keep things loose (an improv version of an open mic night). Friday and Saturday nights have three shows each, and you can buy a three-show pass and make a full evening of it at a special price if you like. Currently running on Fridays, there’s an early extra show (not part of the later three show combo) - Happy Hour With Nimblicity (6:30pm) - office based improv, for those coming down off a week at the day job. Your ticket price includes an adult beverage. The three show Friday night slate right now is Creature Feature (monster movie improv) (8pm), Attenborough: The Improvised Wildlife Documentary (9:30pm), and The Good, The Bad, and the Bearded (improv playing with the tropes of movie/TV/literary westerns) (10:30pm). Saturday’s trio starts with Harold Turns 50 (3 casts tackle the classic improv form) (8pm), and Super Good (taking simple ideas to their furthest physical and emotional distance) (9:30pm), followed by Interludes (10:30pm).